I’d like to take a quick poll. Three Questions. How many of you are vegan or vegetarian, and think the slow cooker is not your friend? How many of you are full-fledged carnivores and think your tummy and tastebuds wouldn’t be satisfied without meat or cheese? How many of you, whatever you eat, think slow cooker food is just bland, boring, and unhealthy? Actually, one more. How many think that pot pie up there looks pretty darn delish? I don’t blame you. Any of you. I can understand. Slow cookers are meant for meatballs and roasts. And people who like meatballs and roasts just don’t understand how beans or tofu can make a meal. And all of those things, smothered in sodium-laden soup mix, kind of all taste the same after hours of being smothered. Because pretty much all slow cooker recipes boil down to soup mix. But that pot pie does look pretty good. Right? Wrong. Well, except for the pot pie part. I know a book that will disprove both of those things, and it’s called The Vegan Slow Cooker. This paperback gem, written by fellow food blogger Kathy Hester (I love when bloggers write books!) contains over 100 recipes sure to satisfy all kinds of eaters and cooks. When Kathy asked me to review her book, I was flattered and excited. When it arrived in the mail and I got to flip through it for the first time, I was giddy. See all those bookmarks? Those are signs of a good book. A book so tasty I can’t decide to make first. Would it be the Chile Relleno Casserole (hello, it’s got chickpea flour!) or Creamy Mushroom Lasagna? Or perhaps the Lemon Tea-Thyme Blondies? You didn’t forget that these are all vegan, right? A good deal are gluten-free too, or can easily be adapted as such. Delicious sounding recipes and pretty pictures weren’t all that excited me, however. Short ingredient lists (don’t you just hate having to buy a million weird things?) and easy instructions are another reason to love this book. Kathy even gives instructions for what you can throw together the night before (literally, this might be chopping a few things or whipping some ingredients together in the food processor, nothing more). I also like that she tells it like it is, for example: “if your slow cooker runs hot or you will be cooking for longer than 8 hours, add another cup or two of liquid.” I confess that one of the struggles, when writing a recipe, is coming up with precise quantities and instructions that will work for everyone, but sometimes it’s just not possible, especially for slow cooker recipes where time and temperature can vary quite a bit! I like that she gives us that little, but important, reminder, because she wants to make sure the recipes work for you. And I can’t see why they wouldn’t. Having spent some quality time with The Vegan Slow Cooker, I can honestly tell you that the recipes are super quick to prepare. Who wants to spend a long time prepping for something that’s meant to save time? Not me. And, I can tell you that the recipes are superb. 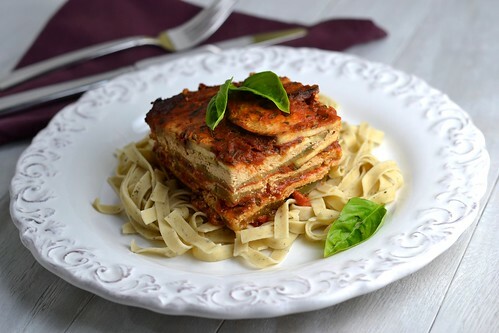 The Italian Eggplant Casserole was something my husband called leftovers on before he finished eating (as in, “how much is leftover? Can I take it for lunch tomorrow and the next day?”). My mother, who has never eaten tofu outside of hot and sour soup, was equally impressed with the Pantry Pot Pie. Fortunately for you, the publisher has agreed to let me share these recipes. I hope you enjoy them as much as I do, and get a good taste of what’s to come when you purchase The Vegan Slow Cooker. 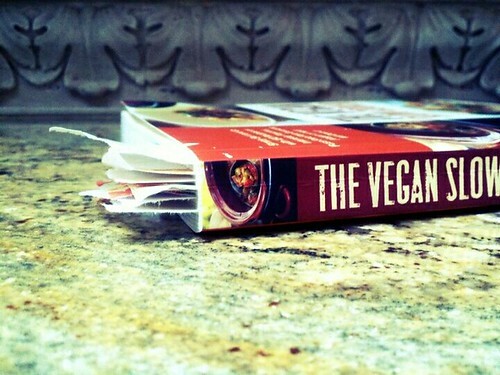 If you’re a vegan or vegetarian, you already know you’ll get plenty of use from this book. If you’re a shameless meat-and-dairy eater like me who’s not convinced that eliminating those foods is necessarily healthier, simply consider that eating meat-and-dairy-free meals once in a while is a good way to save some money and lessen your load on the environment. Well, that, and they taste great and are easy to make! Place the cut-up onion, garlic, celery, and seitan (or tofu, sausage, or potatoes) in a large air-tight container in the refrigerator. Oil the crock of your slow cooker (or spray lightly with nonstick cooking spray.) 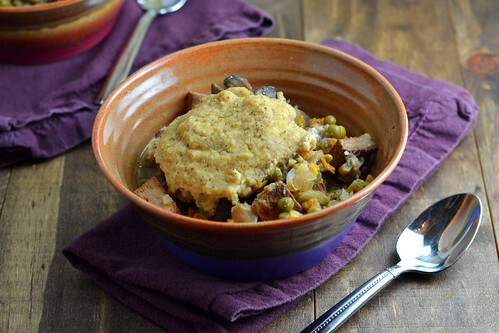 Combine all of the stew ingredients except for the flour in the slow cooker. Add 1-2 cups extra water if you plan to cook this for longer than 8 hours, or if your slow cooker runs hot (I used 2 1/2 cups of liquid total.) Stir and cook on low for 6-8 hours. About 30 minutes before serving, add more water if this mixture seems too thick. Or, add flour if to thicken it up, if desired. (I spooned out some of the liquid and mixed it in a small bowl with the coconut flour, then stirred this back into the slow cooker.) Taste and adjust seasonings. To make the biscuits, combine all of the ingredients in a bowl and work until it comes together into a dough. Turn the mixture onto a floured cutting board, roll about 1/2 inch thick, and cut into circles with the rim of a glass. Place in the slow cooker on top of the filling. (My mixture did not come together into a dough; it was more like a thick batter, so I simply spooned it on top of the stew. Next time I would not add all of the milk at once, I would instead start with just a little and add more as needed.) Turn up the slow cooker to high. Prop the lid open with the handles of a wooden spoon, or place a clean dishtowel under the lid to prevent condensation from dripping onto the biscuits. Cook an additional 30 minutes. *To bake tofu, preheat oven to 475ºF. Drain the tofu and cut into cubes (there is no need to press the tofu, as some recipes call for.) Spray a large baking dish with nonstick cooking spray, and place the tofu cubes in a single layer in the dish. Spray the tofu lightly with cooking spray. Bake for 25-30 minutes, turning 2-3 times, until lightly browned and crisp. The book has many recipes which call for tofu without baking it first, so you can put it in that way as well. I just assumed I’d like the firmer texture better. Make the ricotta by blending all of the ingredients in a food processor or blender until smooth. Store in a covered container in the refrigerator. Oil the crock of your slow cooker (or spray lightly with cooking spray.) Pour in 1/3 of the marinara sauce. Top with half of the eggplant slices, half of the ricotta, and another 1/3 of the sauce. Repeat the layers once more, then top with the remaining sauce. (I sliced my eggplant thin enough that I ended up with three layers each of eggplant and ricotta, alternated with sauce.) Cover and cook on low for 6-8 hours. Serve with pasta. If your slow cooker does not run hot and the dish seems water, remove the lid and turn the slow cooker to high. The liquid should evaporate in 30-60 minutes. Thanks again to Kathy Hester and Quayside Publishing Group for letting me review The Vegan Slow Cooker. The book was provided to me at no cost, and as always, opinions are my own. these look great im definitely bookmarking! So funny, I have a vegan stew on with dumplings right now! Great review. 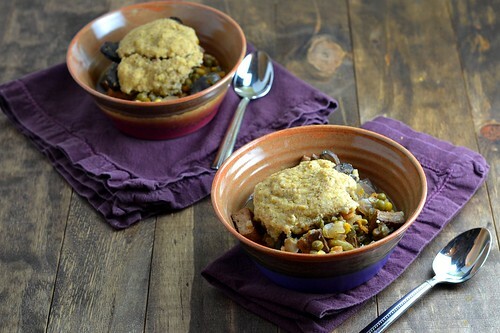 I'm always on the lookout for vegetarian slow cooker recipes! I love me some slow cooked shredded meat, but it would be nice to throw a bunch of veggies in there once in a while, too 🙂 Gorgeous photos my dear! I'm definitely going to have to look into getting this cookbook! Janet is right, that lasagna looks amazing! I tend to not use my slow cooker that often partly because all the food ends up looking super NOT photogenic. But I guess that's silly and kind of vain. That lasagna looks amazing! I would've never, in a million years, believed it to have come from a crock pot. And that pot pie recipe…yum!! I love the idea of cooking the biscuits in the crock. Neat-o! Adding this cookbook to my wish list on Amazon! these do look great 🙂 especially the pot pie (and i don't normally say that!). i need to get me an oval shaped crockpot… doubt lasagna would work in the one i currently have! I like both veg and non veg and I love love pot pie. Slow cooking can get a little tiring at times but, for certain you need that ..running away from it will only spoil the dish 🙂 That Lasagna is just perfect and making me drool here ! Wow, everything looks so amazing! 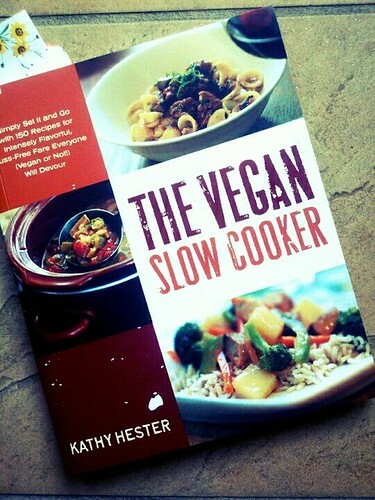 Where was this book when I was vegan and DYING for slow cooked meals?! I have a slow cooker I rarely use it . Maybe this article will give me a reason to use the slow cooker. I’m not a vegan or vegetarian but I think I might like some of these. I have a couple other recipes I just haven’t had the time to cook them. I was wondering if it is ok to not have exactly the 1/2 of cup of the yeast. I am not sure if it would make a difference. Do you soak the cashews before blending for the ricotta?